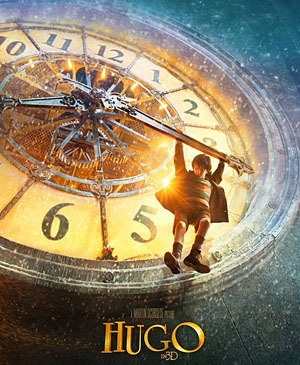 Half of Hugo is a Good Movie. But Which Half? The film begins magically and you can tell it is a true labor of love. The whole thing is beautiful. The child actors are excellent. Sasha Baron Cohen flirts with greatness. But for all the loving detail and the directorial confidence, the whole thing strikes me as . . . self-indulgent. could even say seduces — the audience into thinking we’re about to be swept away into a magical tale akin to the Lion, the Witch and the Wardrobe (the book, not the movie). Instead, it becomes an at times didactic treatise on the wonders of film and, yes, the burning need for film preservation. There’s no real magic, just fairly heavy-handed allusions to the magic of cinema. It’s all very meta if you ask me. Since Jonah and I disagree about nearly everything else, I suppose it’s appropriate that I had almost precisely the opposite reaction to Hugo. The first half of the film disappointed me: it rambled tediously, provided no real sense of why I should care about Hugo or anyone else, and the narrative was driven by the most ridiculous kind of coincidence mongering. And Sasha Baron Cohen? I thought he came very close to ruining the film entirely. But in the second half, when the coincidences are over and the plot is finally allowed to move forward more naturally, driven by the needs of the characters rather than the need to set up the premise, the whole movie turns a corner. It’s by turns fascinating, touching, and interesting in a genuinely historical way. Sure, I guess you could say it was all about the burning need for film preservation, but only in the same way that Hamlet was about the burning need for better governance structures in Denmark. But I’ll agree with Jonah in one respect: the film’s marketing does indeed make it seem like some kind of fantasy-based children’s movie. This is pretty blatant misrepresentation, and I’d swear there are one or two short, entirely gratuitous scenes in the movie that are there solely to provide fodder for the trailers. There’s no fantasy in Hugo, just an earthbound story that could stand to have been told a bit better at the beginning and that should have ditched Sasha Baron Cohen completely. Better than most movies these days, though. I didn’t swoon over it — and, as usual, I didn’t feel like 3D added anything to the experience — but it’s worth seeing. Just be sure to go in expecting less enchantment than the ads suggest.